Keeping with longtime custom on the feast of heaven's messengers of choice – the Archangels – on Saturday the Holy See released the Pope's pick for the theme of 2013's World Communications Day: "Social Networks: portals of truth and faith; new spaces for evangelization." A further reflection of B16's determined leitmotif for the Vatican's 2012-2013 cycle – the impending Year of Faith, intertwined with a focus on the New Evangelization – on another front, the selection becomes the latest WCD topic to look beyond more traditional means of communication, turning again instead to social media and its place in ecclesial life. In that, the theme continues a running digital thread for Communications Day stretching back to 2009, when the observance was dedicated to "New Technologies, New Relationships." Saying that "one of the most important challenges facing the task of evangelization today is that which is emerging from the digital environment," in its announcement of the theme-choice, the Pontifical Council for Social Communications explained that "during a time in which technology has emerged as part of the fabric of connectivity of human experiences, such as relationships and knowledge, we need to ask: can it help men and women meet Christ in faith? It is not enough to find an adequate language, but rather, it is necessary to learn how to present the Gospel as the answer to that basic human yearning for meaning and faith, which has already found expression online." "In particular," the council said, "we need to be attentive to the emergence and enormous popularity of the social networks, which privilege dialogical and interactive forms of communication and relationships." 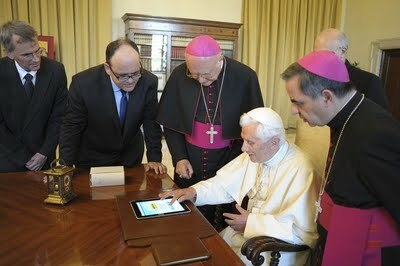 Responding to the selection, Italian Catholicism's lead expert on faith in the digital world – Jesuit Fr Antonio Spadaro, now editor of the Vatican-vetted journal Civiltà Cattolica – responded on his blog, CyberTeologia, that the theme was notable in that Benedict had opted to "skip a moralistic approach" on social networks in favor of affirming their optimal role as venues "of relationship, knowledge and understanding." The lone annual celebration called for by the fathers of Vatican II and first held in 1967, the WCD is marked on the Sunday before Pentecost, now observed in most of the Catholic world as the transferred Ascension Day. The theme-choice is fleshed out further in the traditional papal message for the event, always released on 24 January – the feast of St Francis de Sales, patron of writers and journalists. For purposes of context as the two major networks' sizes go, Facebook reportedly tops 950 million members worldwide, while Twitter breezed past the 500 million mark earlier this year. Beyond the platforms, a study released yesterday from the Pew Research Center indicated that over half of all American adults now have mobile access to the internet, whether via a tablet or smartphone. Much as the wider world is likely to deem a bookish, 85 year-old academic who scribbles his drafts in longhand as a fairly disconnected messenger when it comes to matters tech, where the rubber hits the road in Rome, it wasn't lost on some that, in the same Bollettino which relayed next year's Communications Day theme, Benedict had – for the first time in North America, and likely well beyond – named a blogging priest as a diocesan bishop. So it seems, the confluence was no accident – in a break from the common procedure these days, the latter wasn't given a choice of his appointment date. Yet even that ain't all. 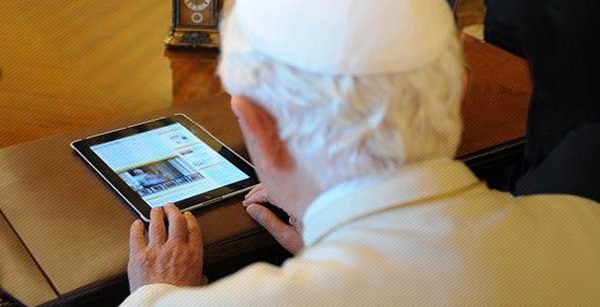 Much as the pontiff publicly provided the Tap Seen Round the World, touching an iPad (above) to launch a Vatican news portal and send a (prepared) tweet in 2009, a recent report speaks of an even greater shift behind the scenes: namely, that an Apple tablet's become part of the Pope's personal routine. In an early September piece in Il Giornale, the Italian vaticanista Paolo Rodari asserted as "true" that, over his recent summer retreat at Castel Gandolfo, Benedict "brought an iPad with him to scan the newspapers." Of course, one need not be limited to reading the papers with an internet device... and that potential leveling of the playing field arguably marks a watershed. Said to have been a gift from the president of the Pontifical Council for Social Communications, Archbishop Claudio Maria Celli – who, it should be noted, delivered the keynote at last weekend's Indiana celebrations for the centenary of Our Sunday Visitor – a papal iPad would constitute the first known use of a computer by a Pope for personal purposes (i.e. beyond a photo-op). In terms of Joseph Ratzinger's personal habits, meanwhile, even a slight departure from the printed page would be just as significant. According to reports around the time of his election, the then-cardinal entrusted any internet research he sought to his two longtime personal aides – the consecrated laywomen Birgit Wansing and Ingrid Stampa – who remain tasked with typing up the handwritten drafts of his books and speeches. 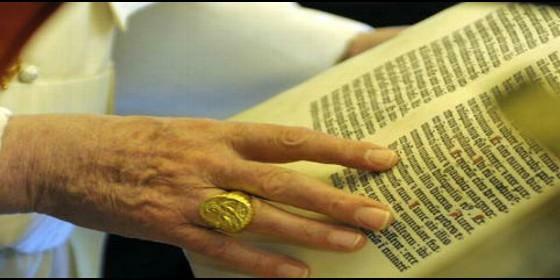 Along the same lines, his cellphone was said to have been toted by his priest-secretary, Msgr Georg Gänswein. And having spoken once of the volumes in his library as akin to "old friends," over the summer Benedict told his recently-tapped nominee to head the Vatican Archive, the French Dominican Archbishop Jean-Louis Brugués, that his "dream" before becoming Pope was to be transferred there from the CDF so he could spend his days immersed in its centuries-long collection. In other words, instant communication has never been known this Pope's forté. Then again, while the increased convenience of what John Paul II termed technology's "rapid development" has brought the notion of a web-surfing Pope – even one midway through his ninth decade – into the realm of the possible, odds are there'd be another, no less formidable catalyst behind it. As a chastened B16 himself admitted in the wake of the 2009 debacle sparked by the Holocaust-denying statements of the SSPX Bishop Richard Williamson, "consulting the information available on the internet would have made it possible to perceive the problem early on. "I have learned the lesson," he said, "that in the future in the Holy See we will have to pay greater attention to that source of news." And as this pontificate goes, that communication message just might've been the most consequential one of all. On a final note, despite being anticipated by Curial officials earlier this year, a personalized Twitter handle for the Pope has yet to materialize. Even so, the lack of it hasn't kept a growing group of his hierarchs – at least, on these shores – from going the 140-character route. Among other Stateside prelates recently joining the archbishops of New York and Los Angeles on the Timeline, Bishop Kevin Farrell of Dallas launched his own feed on Saturday, just on the heels of accounts set up by Bishops James Wall of Gallup, James Conley of Lincoln, Rick Stika of Knoxville and Archbishop Paul Coakley of Oklahoma City, whose installation homily included a memorable reference to Facebook – on which, while we're at it, Archbishop Gregory Aymond of New Orleans has freshly taken to posting daily status updates. Likewise joining the mix – in a notable sign of a new era at the nation's traditional "flagship" Catholic journal – is Jesuit Fr Matt Malone, who went live yesterday, his first day as editor-in-chief of America. Just ordained in June, the 14th lead scribe of America House is the youngest to hold the post in the mag's 103-year history. All that said, did we miss anybody? ...or, for that matter, who could possibly be next?